You can see Zidane testing the boot here. Below is the official adidas press release about the boot. I apologize, but it is not absolutely necessary for me. Are there other variants? Other colors will be released over time. There are also less expensive versions of the Predator. 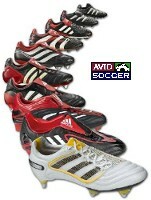 Visit ASER for reviews on boots (http://blog.avidsoccer.com/categories/Boots.aspx).